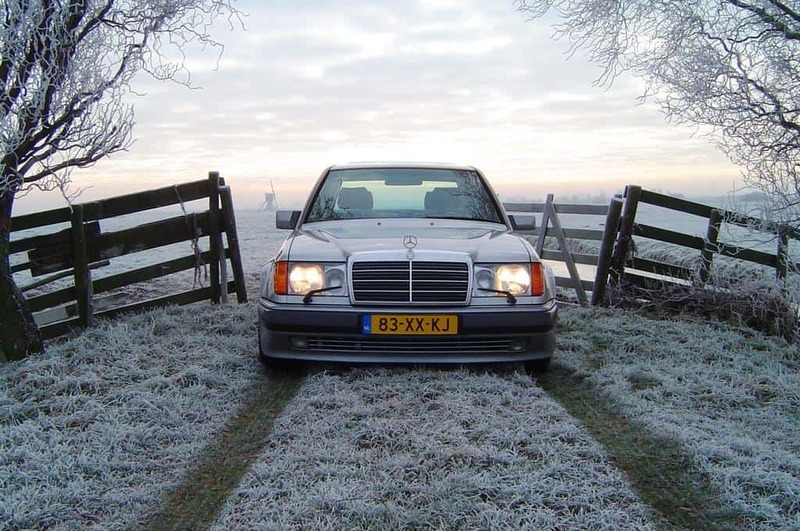 Mercedes-Benz W124 500E/E500: The first true four-door Porsche was actually a Mercedes-Benz. The actual first photo I ever saw of a 500E that was published in 1991 in Car and Driver magazine. 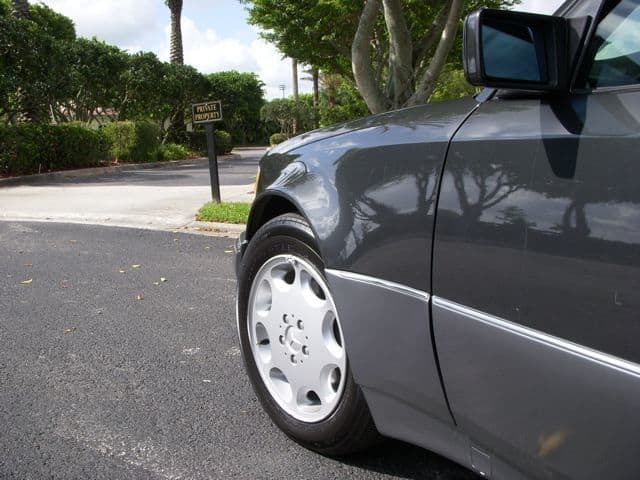 The Mercedes-Benz 500E first caught my eye in late 1991. Car and Driver magazine ran a short piece about the forthcoming German “super sedan” that was to be an unusual collaboration between Mercedes and Porsche. I first saw a photograph of the 500E when I was a junior at Boston College and ever since that day I dreamed of someday owning that special car. Many years later in 2004, my dream finally came true when I acquired a very special 1994 E500. In 1991, the Mercedes aftermarket sport tuner Aufrecht, Melcher, and Grossaspach (better known as AMG) was still an independent company. Almost a decade after the launch of the 500E/E500, AMG was officially acquired by Mercedes-Benz. In the late 1980’s BMW had successfully launched the first M5, which was a high-performance Motorsport version of the 535i. The first M5 was based on the aging E28 platform. BMW quickly followed up with a more powerful second-generation M5 based on the more modern E34 chassis. The M5 had the first mover advantage and set the standard for the mid-sized super sedan category. In the meantime, over at Mercedes, their mid-sized super sedan cupboard was bare. Mercedes needed to have a car to stake its claim and compete within the burgeoning super sedan category. 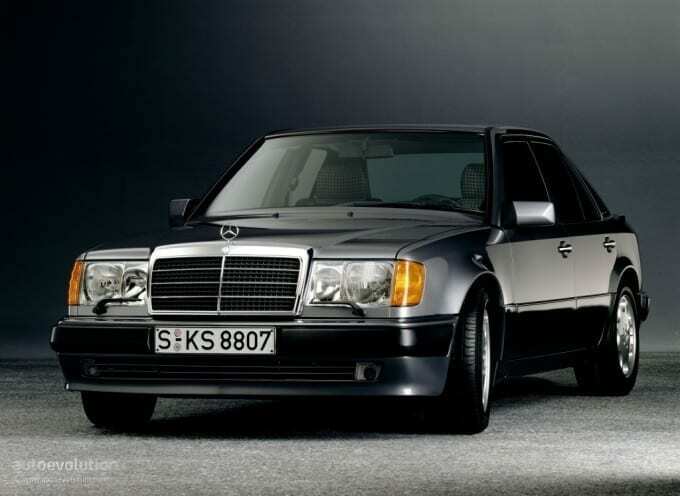 In 1990, the largest displacement mid-size sedan in the Mercedes lineup was the 178 horsepower six cylinder 300E. In the late 1980’s Porsche was still feeling the pain of a strong Deutsche Mark and a worsening global slowdown. As a result, the Porsche factory at Zuffenhausen had spare production capacity and management was eager to fill it. A historic deal between Mercedes and Porsche was consummated. Built to compete with the M5, the 500E/E500 project began in 1989 as a joint venture with Porsche. 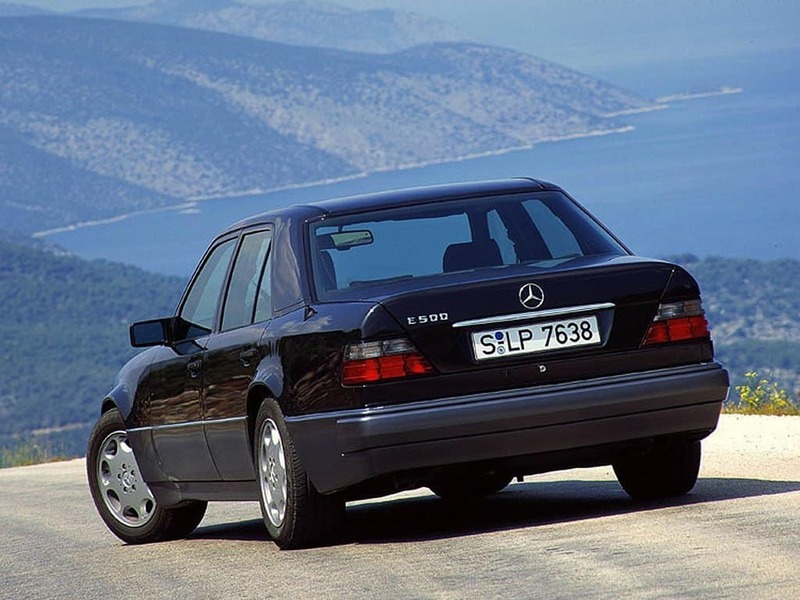 The platform was to be based upon the highly successful E-class W124 chassis. The car that was ultimately built became the high-water mark of post-war Mercedes quality. For a modern, mass-produced car, the 500E/E500 was relatively low-production, had a bespoke feel, and involved all kinds of unusual extra work for both manufacturers. Of the total 10,479 cars produced between 1991 and 1994, only 1,505 were officially imported into the United States. Even during the zenith of the 500E/E500 production years, it was rare to see one rolling down an American road. The subtle design cues of the 500E/E500 made it hard to differentiate the “wolf in sheep’s clothing” from a mainstream lesser E class. Today you have to scour the Internet just to find a single very used 500E/E500 for sale. The 500E/E500 was always a classic to me, but today the market still treats it like a used car. It is possible that the market could start to recognize this landmark automobile in the coming years. The 500E/E500 should become more desirable in the future given both its unique history and the memorable experience it bestows upon on drivers. The 500E/E500 enjoyed a manufacturing process that was distinct from most automobiles produced in the modern era. Conversion of the existing W124 chassis into the 500E/E500 was done the old-fashioned way—by hand. During assembly, all 500E/E500’s were manually pushed around the Porsche factory floor on rolling dollies. 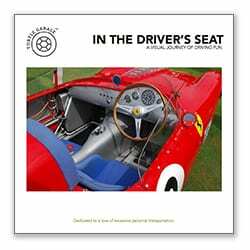 Each car took over eighteen days to complete. At various stages of production, the cars were physically transported several times back and forth across Stuttgart between the Mercedes and Porsche factories. While not efficient, both companies shared key aspects of the design, development, modification, and production of the 500E/E500. Porsche strengthened the W124 chassis and widened the standard transmission tunnel in order to fit the much larger and heavier Mercedes-Benz 4,973cc aluminum block DOHC 32-valve V-8. Stampings from Mercedes-Benz and other suppliers were sent directly to Porsche so they could be hand welded onto the W124 chassis. The front and rear fenders were widened to accept the bigger tires and larger track of the 500E. The fender modifications were the only true visible aesthetic changes that distinguished the 500E/E500 from its comparatively anemic 300E sibling. The blown fenders combined with its lower stance give the car a more substantial, almost sinister shark-like appearance. The 500E/E500 shared brakes, suspension and other components with the groundbreaking all-new R129 Mercedes 500SL that was introduced in 1990. Rust proofing, painting, and final trim installation occurred at the Mercedes factory. Again, the cars came back to Porsche to have the engines installed. After all the back and forth, Porsche completed final assembly. Before delivery, the cars were shipped back across town and underwent final testing and delivery preparations by Mercedes-Benz. The 500E/E500 was not for everyone. In 1992 when the car arrived in the United States, the price was set at $80,000 (in comparison, a plebian 300E in 1992 dollars cost $49,500). Adjusted for inflation, the 500E/E500 was about $128,000 in today’s dollars. Add a United States gas-guzzler tax of $2,600 and the total price pushed the four-door super sedan into very exclusive territory. Heavily laden with luxury features, the 500E/E500 came standard with heated Recaro sport seats, Becker radio/cassette/CD, driver and passenger airbags, traction control, ABS, an automatic rear sunshade, and a 155 MPH speed limiter. The addition of a passenger airbag sacrificed the glove compartment. There were really no options on the car other than a CD changer. It was said that Mercedes-Benz lost money on each and every 500E/E500 that was produced. Given the 18-day production cycle, the back and forth between factories, and all the hand craftsmanship, it’s easy to see why the car was a not-for-profit project. For Mercedes-Benz, this car was less about profit and more about making a statement to the rest of the automotive world. The 500E/E500 has one of the most user-friendly and attractive cockpits of any modern car. VDO gauges, Recaro seats, a Becker radio, and a pungent aroma of Mercedes premium leather gave it a distinctly Teutonic German feel. In many ways, the 500E/E500 was the spiritual successor to the high performance 1968 Mercedes 300 SEL 6.3 and the infamous high-performance 1975 Mercedes 6.9. In other ways, the 500E/E500 is unlike anything that came before or since—from Mercedes of any other manufacturer. I fell in love with the 500E/E500 from the day I saw it within the pages of Car and Driver. 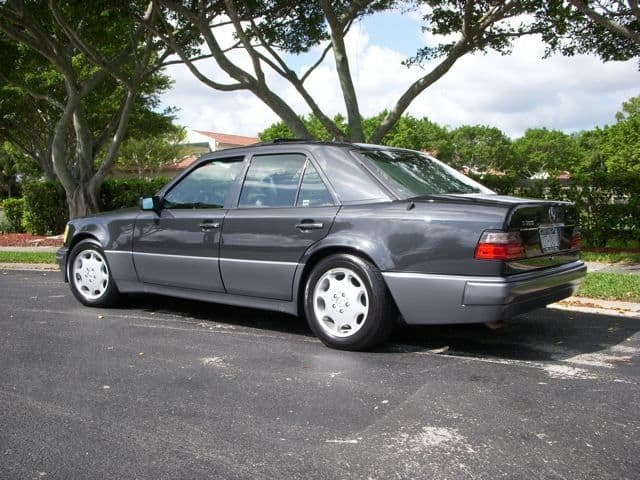 I think it is truly one of the best sedans ever built by Mercedes-Benz or anyone else for that matter. The car has a rare subtleness to it. It has a phenomenal bank vault build quality. With every mile it devours, the car reminds you that it is no ordinary vehicle. Even by today’s ludicrously high horsepower and performance standards, the car is still an impressive performer. It’s well balanced, easy to drive, very powerful and has a substantial feel on the road. The sedan is heavy yet nimble and it’s not really a large car. The 500E/E500 is so competent on the road and is very much at home lumbering along at 120 miles per hour. 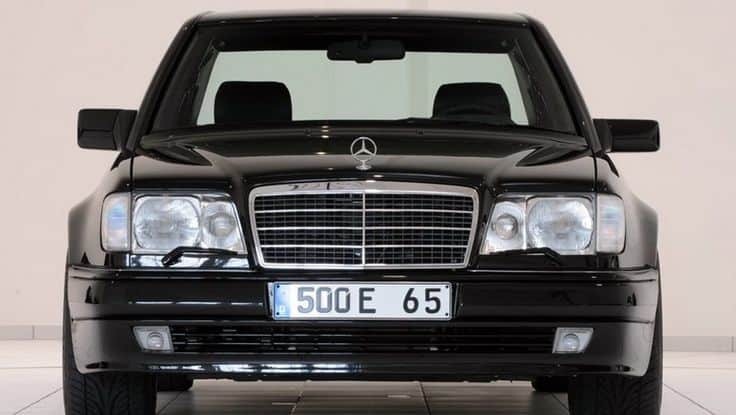 A pre-1994 Euro-spec 500E with the European headlights and the big classic traditional Mercedes-Benz grill. 1992 and 1993 U.S. versions had slightly different headlights than their European brethren. European spec cars can be identified by their flush glass “European style” headlamps and big headlight wiper blades. My E500 was built toward the end of the production run in June 1994. Given the production date, the car is likely one of the last 1994 models manufactured. In its final year of production, the 500E was rebadged the E500 as all Mercedes models changed their naming convention to alphanumeric. 1994 is the rarest and most refined and desirable of the series. Only 374 E500’s came to America in 1994. The 1994 model is aesthetically distinguished by a smoother and more modern front and rear end. The 1994 styling updates give the car an integrated, cleaner and more modern look. Technical upgrades in late 1993 and 1994 included much larger 12.6-inch brakes from the SL 600. I have a unique personal history and rapport with my E500. I have known the car since it was brand new. I started my first job out of college in 1994 and I was assigned to a management training position in Buffalo, New York. Buffalo in January was a tough sentence, but it just so happened that long time family friends lived in nearby East Aurora. I ended up being taken in like a 7th son and lived at their beautiful farm during the winter until I finally got my own apartment in the summer. One lazy August afternoon I stopped by the farm for dinner and a brand new E500 was sitting in the circle in front of their Frederick Law Olmstead designed estate. It was a spectacular setting and the new E500 completed the picture. Great Lakes Motors, the local Buffalo Mercedes dealer, had just dropped it off for the family to test drive for the weekend. We took it for a drive up and down the infamous “400 Autobahn” Buffalo expressway. There we let the big new Benz stretch its legs. One drive made the decision easy. I remember that drive like it happened yesterday. The big V8 kept pulling smoothly and effortlessly into triple digit speeds. The car could also stop in the blink of an eye. They ultimately bought the car and liked it so much they added another one to leave at their farm in Florida. I negotiated a promise that they would sell one of them to me when the time came to retire them. Ten years later, in 2004, I got the call and picked up the car. It had traveled 63,000 miles, or just 6,300 miles a year. I’ve owned and enjoyed it ever since. My E500 is now over 20 years old. Overall, it is in excellent condition and has been garaged its entire life. It has been dealer serviced and is 100 percent original. It has never had any collision work and to the casual eye it still shows well. Having just turned 90,000 miles it is a driver. Despite all those miles, the car truly looks and drives none the worse for wear. The E500 is simply a car that deserves to be driven and enjoyed. Even after all those miles it drives pretty much as it did on that beautiful August day in 1994 when I first rode in it. This summer I plan to do some significant mechanical and cosmetic work on the car to keep it in top condition. I will be following up with an entry on that project when it commences. The wide fender flares and lower stance give the 500E/E500 a mildly sinister look. 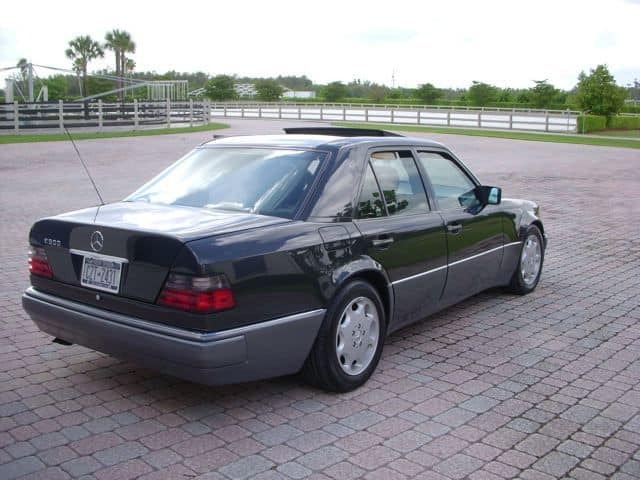 The majority of 500E/E500’s came in this exact color combination, dark metallic gray with back interior. I have seen red, spruce green, smoke silver, and silver versions but the car seems most handsome in this color combination. Of 10,479 cars produced, 1,505 were officially imported into the U.S.
3 Responses to Mercedes-Benz W124 500E/E500: The first true four-door Porsche was actually a Mercedes-Benz. Mine is a 1994 W124 E60 AMG, which I acquired at 6,000km in 1996 and have owned ever since (22 years as of now). Originally, I was looking for either 500E or E500 and had no knowledge of E60 at all. When I found the shop with E500 and after test driving, I was ready to sign but by some coincidence, this shop also had an E60 too. I asked what that car was and after test driving E60, there was no turning back and went for E60. To this day still, I am not tired of my E60 because of her outstanding balance an performance, I am awed every time I drive her. Odometer is currently at 105,000km.